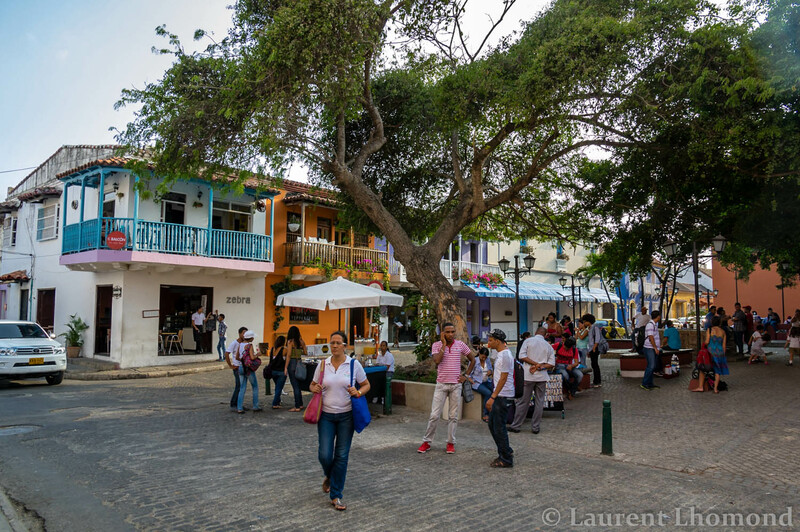 Laurent and I arrived in Cartagena, Colombia on April 29, 2014. This was to be the start of the second half of our Latin American journey and we couldn’t have picked a better place to begin! Bold, colorful and simply irresistible, it’s sure to win over even the most critical traveler. 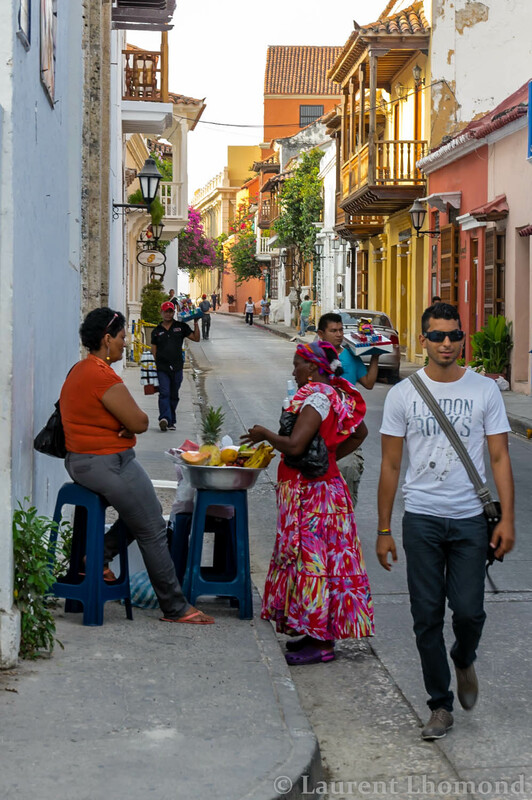 It’s located directly on the Caribbean Sea and while the beaches right around the city leave a lot to be desired (most are pretty murky), the city is so beautiful, you won’t really care. I had a bit of trouble, as my back had gone on the fritz (again), which made carrying bags and traveling a difficult, painful venture. Thankfully, Laurent was there to help me and we decided to take it easy and rest often. I must give you a word of warning; it is HOT here! I’m talking Hades hot!! When I stepped off the plane, the heat completely enveloped me and hasn’t left since! I expected warm and humid (I mean, it’s the Caribbean for crissakes!) but it’s probably the most hot/humid place I have ever been to in my life-more than NY in August and Florida in summer! 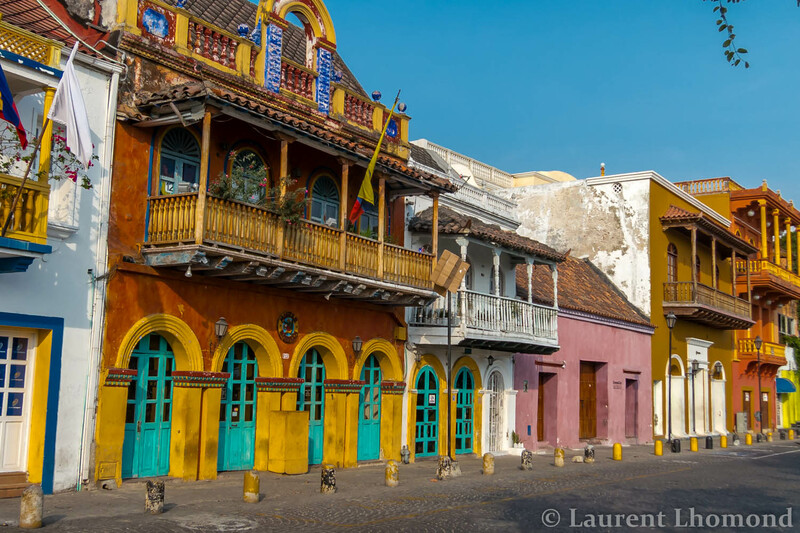 I should also mention, for those of you in the USA, Jet Blue has recently begun service to South America and they have insanely cheap tickets to a few destinations in Latin America but especially to Cartagena, Colombia. We nabbed this ticket for $150-one way direct from JFK. 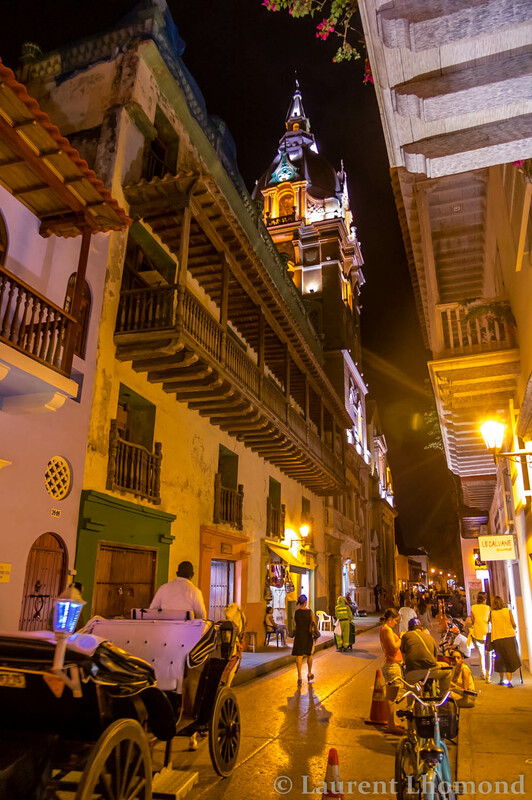 If you are thinking of taking a trip to this wonderful country, thanks to Jet Blue, it could be a great time to put Colombia on your ‘to-do’ list! The heat is worth suffering for because this port city is so appealing & impressive, you can’t help but be swept away by its colorful balconies filled with flowers, friendly people and rich history. But don’t worry, there are plenty of ways to keep cool while you are here (see below for my top 5 favorite ways). The 16th century colonial architecture is vibrant & remarkably well-preserved, which earned the city a nod from UNESCO back in 1984. The old part of the city is completely enclosed by walls where cannons and fortresses were used to help protect from pillaging pirates. 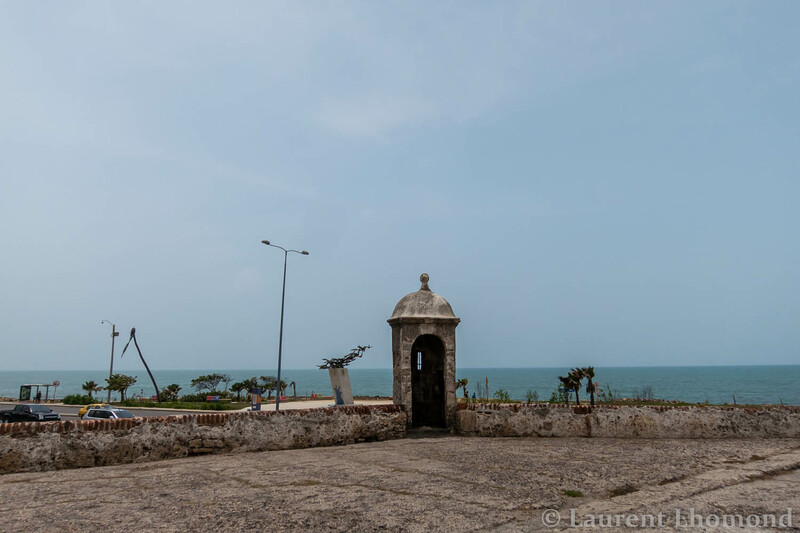 Cartagena was the first city the Spanairds used to expand their empire and was viewed as the entry point into all of South America. The walls remain around the city today, having sustained the test of time and also serving as a reminder of the struggles past. The wealthy royal viceroys were the inhabitants inside this walled part of the city. Many of these colonial mansions remain today in El Centro and San Diego, which are two of the main neighborhoods that make up this area. Nowadays, you are not likely to see pirates but instead are more apt to find horse-drawn carriages pulling the large amounts of tourists that visit the city. 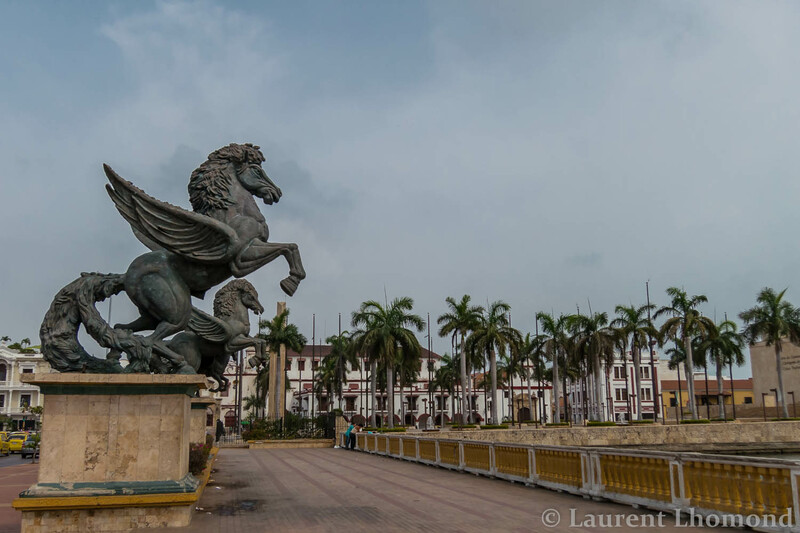 Cartagena was a major port city both for precious metals and for slaves. The Caribbean-African influence is still apparent in the culture, music and the food to this day. 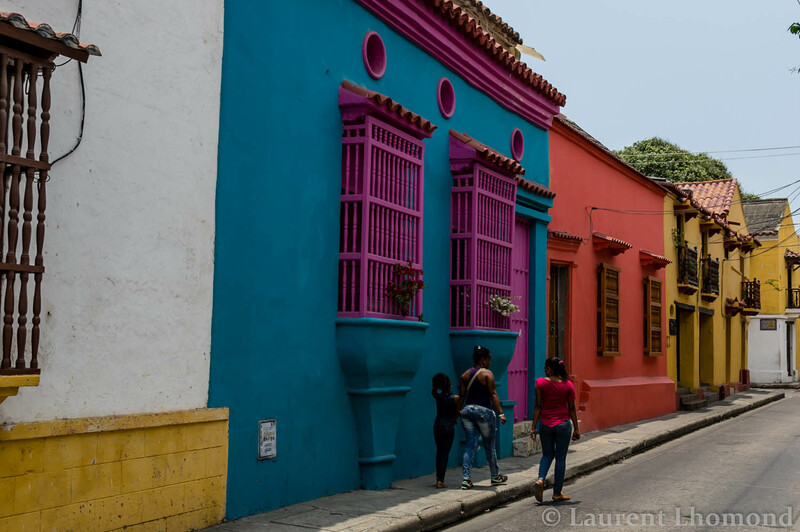 Come along and discover what makes this colorful city so unique through our photo essay of Cartagena! It feels great to be back on this continent and discovering new places! 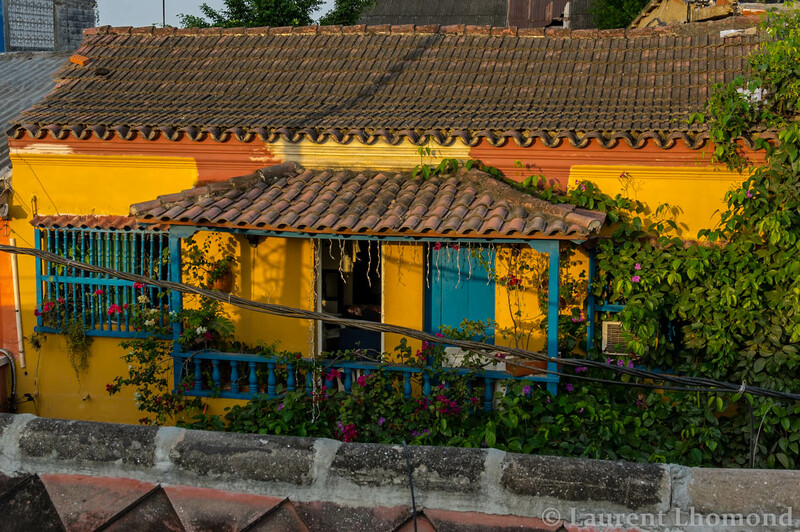 Inside the walled city, you will find the most colorful colonial architecture. Old mansions with their intricately sculpted balconies are adorned with flowers so vibrant, they almost seem to compete with the colors of the buildings. The hues are so saturated and eye-catching, half the time it doesn’t even seem real! The colonial architecture here is so well-preserved. In addition to the balconies, one of our favorite features was the wood-covered windows. In NYC, they use iron grates in front of the windows giving it a jail-like feel but the wood coverings with flowers poking through lent an elegant flair that was simply irresistible. The facades were impressive enough but the insides were even more extraordinary. Sometimes the giant doors were left wide open, allowing one to peer inside the stately mansions. I know I’ve said it like ten times already but the balconies and flowers here are truly amazing. It reminded us both a lot of New Orleans in Louisiana but even more vibrant in color. You don’t know which street to walk down first and so you end up zig-zagging to any balcony that catches your eye. The area called San Diego probably boasts some of the best balconies and flowers in the entire city. I could walk up and down the narrow streets gazing up to take photos for weeks and still not get enough. 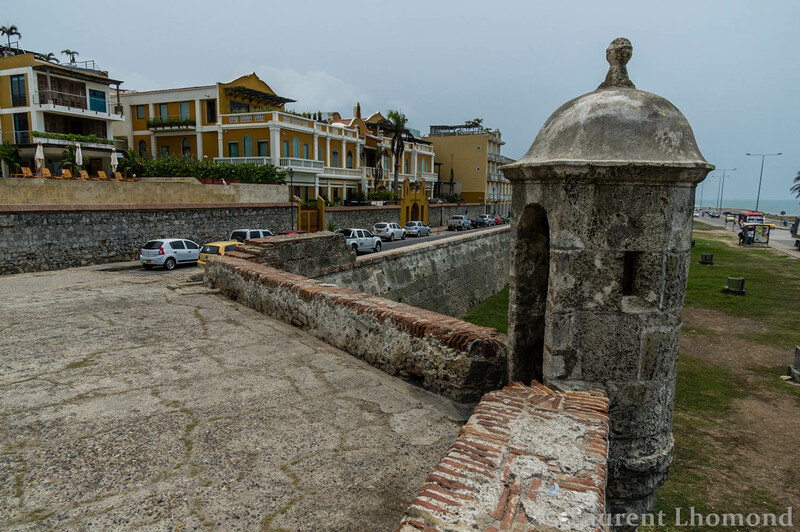 In these photos, witness the fortification of the old walled part of the city. You can see that it looks directly out on to the sea which provided direct protection from attacking pirates. Argh matey, that’s right, I’m talking real pirates! Because Cartagena was a main trading port for gold, pirates would try often to come and pilfer what they could. The walls began construction after the raid on Sir Francis Drake and took over a hundred years to build. 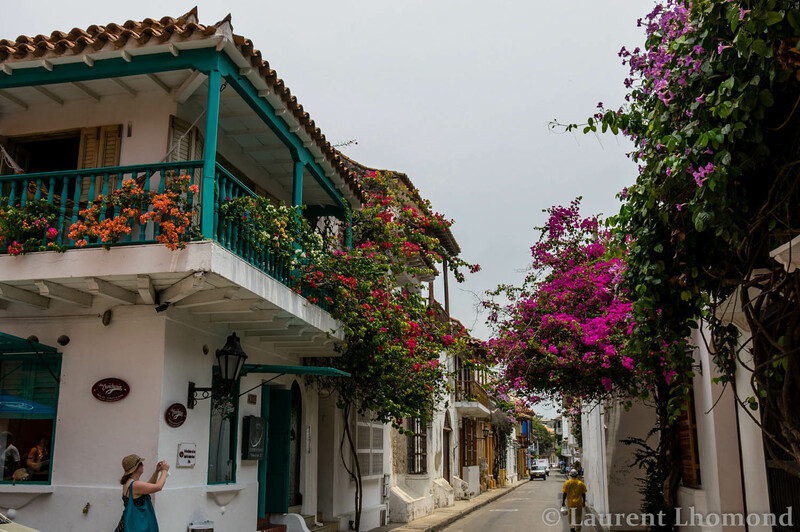 Today, they are littered with tourists and lovers sitting atop because the wall is well known as a prized place to experience one of Cartagena’s stunning sunsets. 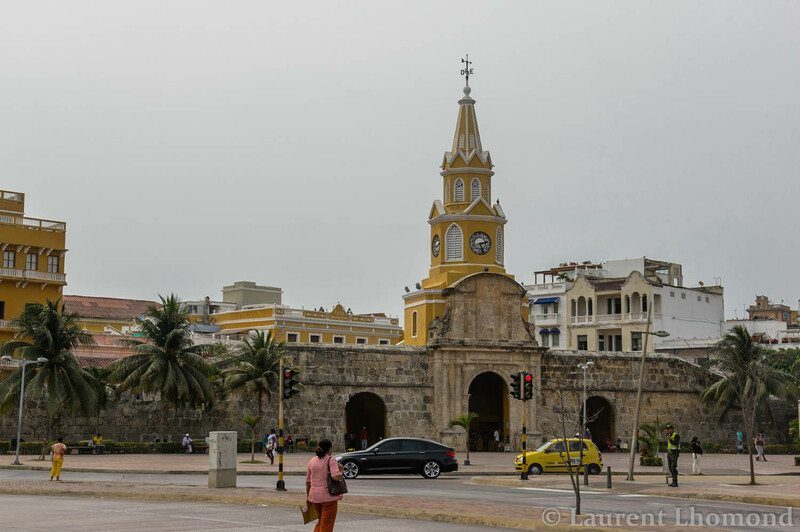 The clock tower is probably one of Cartagena’s most famous landmarks. Originally, it linked up Getsemani (a bordering neighborhood) by drawbridge and moat. Construction began in 1601 and took over 30 years to finish. It is seen as a main entry point into the walled city and it used to house weapons and a chapel! Today, a Swiss clock replaced the old pendulum that used to swing. 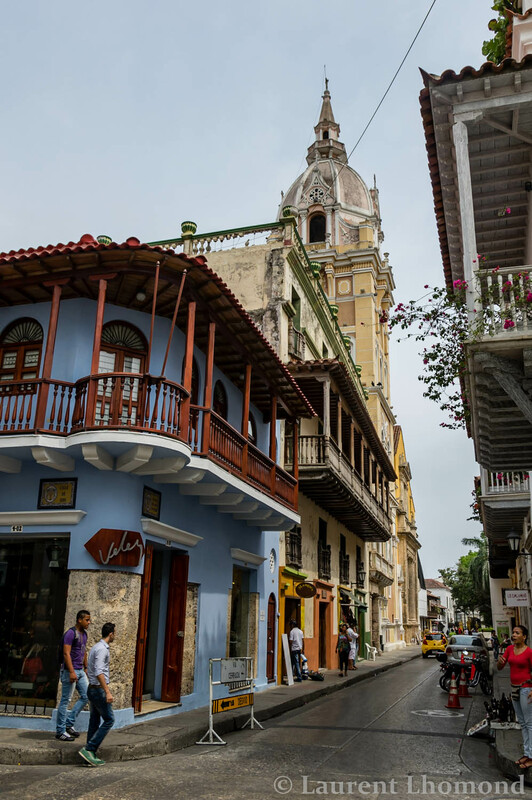 Cartagena is home to a few cathedrals and the cathedral pictured is one of the oldest with construction starting in 1577. Plaza San Diego is bursting with color and is home to many of the cities nicest restaurants. There are also some boutique hotels in the area. El Balcon, one of the restaurants located directly in the square, boasts some great people-watching (and good cocktails!) right from it’s balcony. The plaza is great anytime of the day but really comes alive at night. 1. 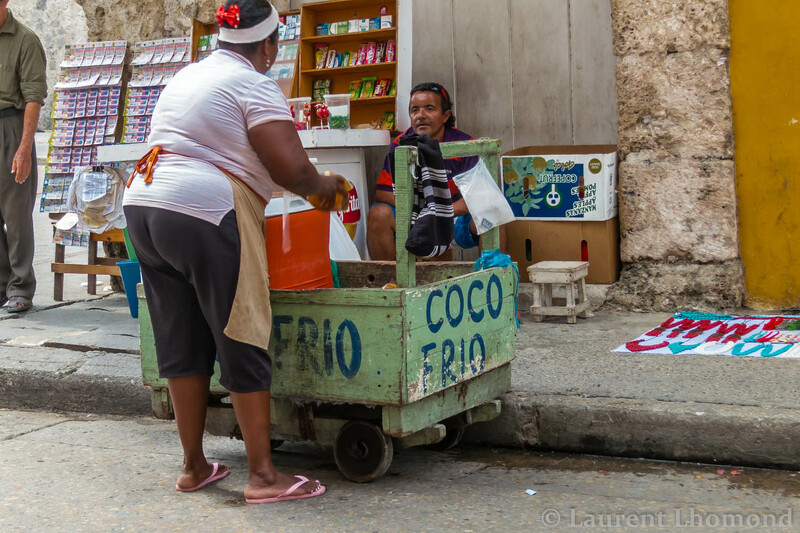 Coco frio sold on the street-these lovely ladies walk around with carts teeming with fresh coconuts chilling in a cooler. They crack ’em open fresh and serve it up cold. Now that’s hydration in style! 2. Cervezas! Thanks to a certain British couple we met, we now coined the invaluable term: beer o clock. 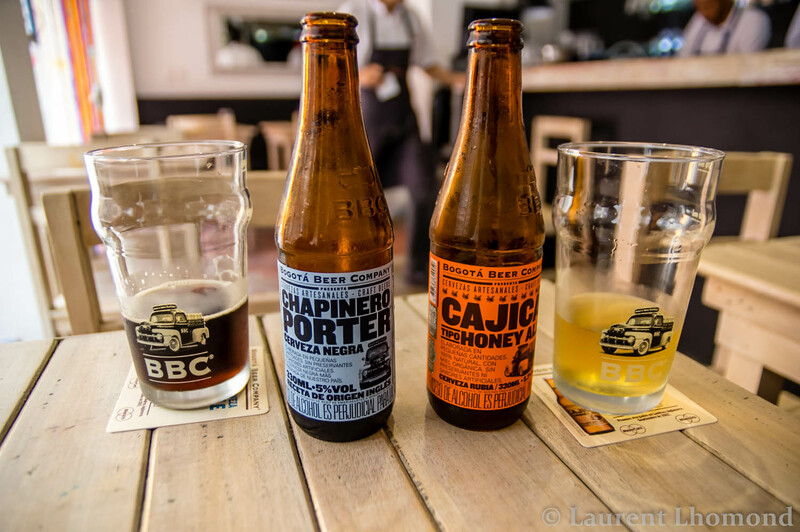 With the kind of hot, sticky days you get in Cartagena, almost every hour turned into beer o clock. A fine way to keep cool. 3. 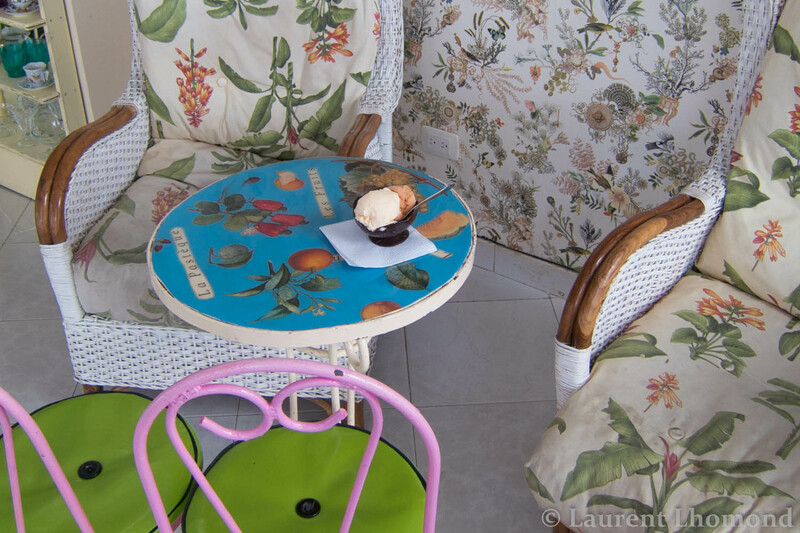 Gelato at Paradiso-I can think of nothing better than sitting in refreshing air conditioning while indulging in one of the many unusual flavors at Paradiso. Be sure to try some exotic Colombian fruits like lulo or camote. Delish and cooling! 4. 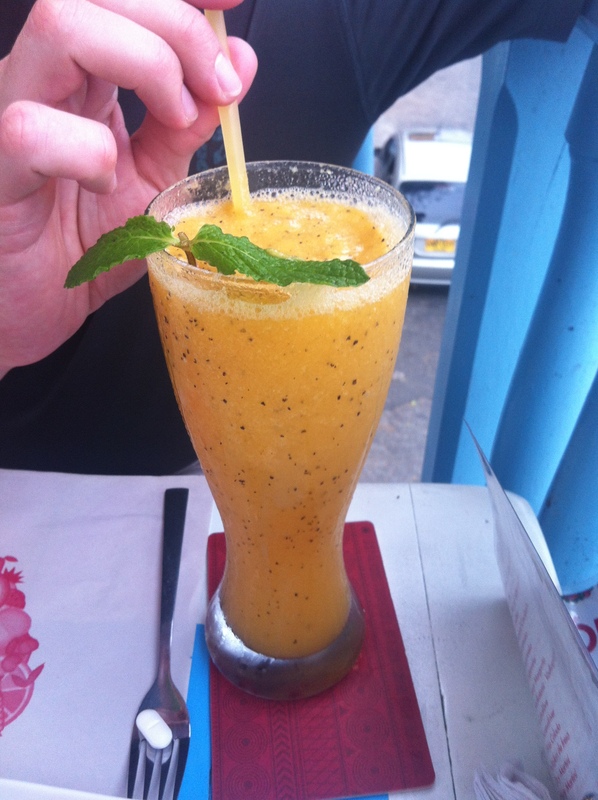 Fresh fruit juices at El Balcon. As previously mentioned, El Balcon, located in Plaza San Diego serves up some thirst-quenching, heat-beating, icy cool juices. Pretty much anywhere in the city you order these from will be good but the people-watching at El Balcon puts these as my favorite. 5. Fruit goddesses on the street. All over the streets in Cartagena, these amazing fruit ladies appear carrying giant bowls of fruit on their heads. One of the best bargains in the city and a sure-fired way to beat the heat! Just outside the walled city, across the Puente Roman, lies Getsemani. This neighbourhood, up until just a few years ago, was plagued with violence, prostitution and drugs. It was an area definitely off-limits for any tourist. Nowadays, tourism thrives here and it’s become a favourite with backpackers but the neighbourhood still retains loads of local culture. 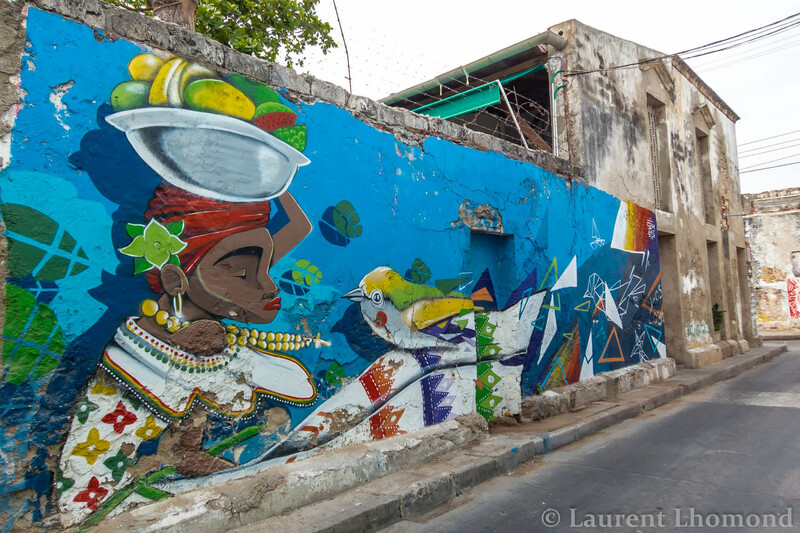 The street art here is the best in Cartagena. It’s bright and colorful much like the city itself. It’s worth a walk over to this part of the city just to check it out. Restaurants of all kinds are springing up in this neighbourhood. 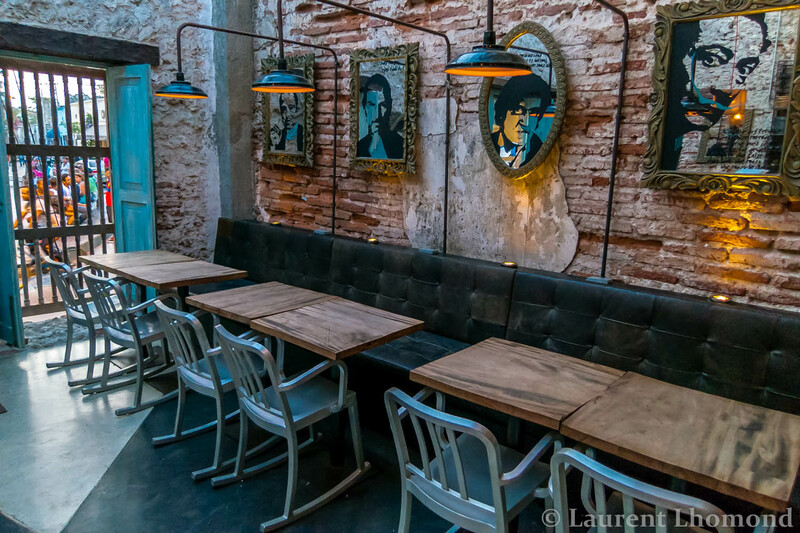 Demente, a tapas bar complete with exposed brick, a retractable ceiling and rocking chairs, looks more at home in Brooklyn than Colombia. The cocktails and tapas are all carefully constructed as is the winning vibe and views over Plaza Trinidad. 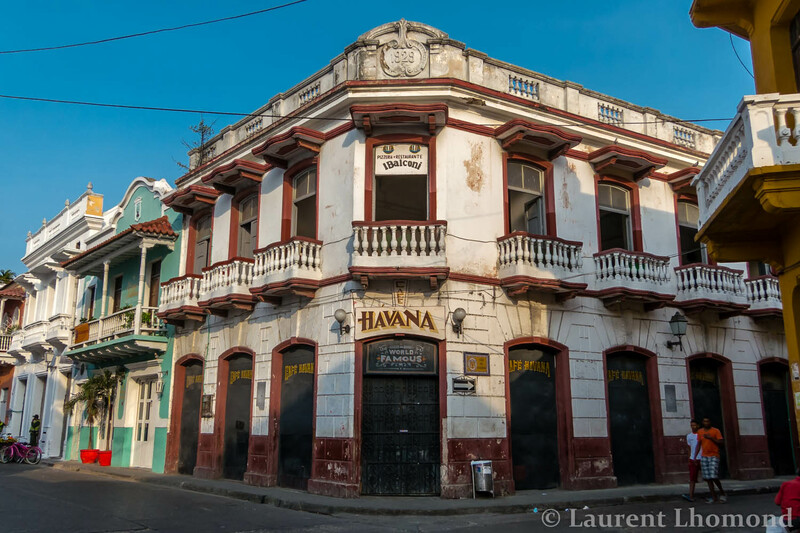 Café Havana is a famous salsa bar in Getsemani offering up classic mojitos and Cuban cigars. 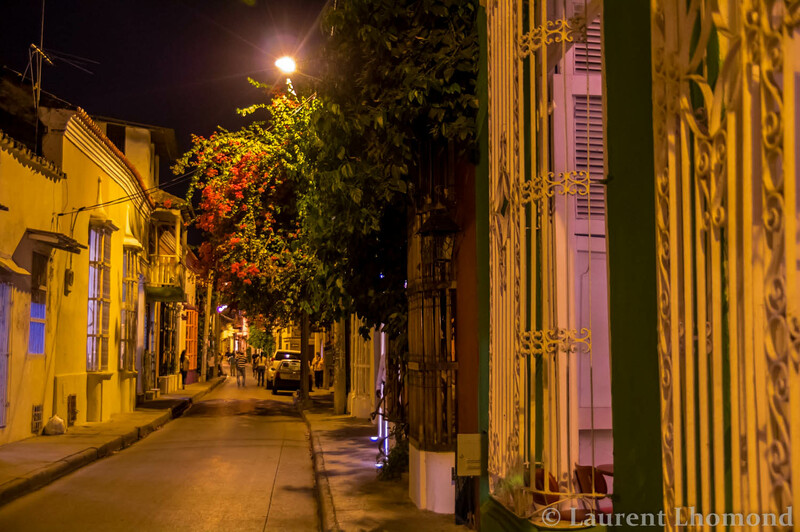 It was and still is a pioneer for Cartagena’s sizzling nightlife. Hillary Clinton was scandalously caught here back in 2012, swilling beers and shaking her booty. Only the USA would make a big deal out of someone having a good time. You go Hillary. 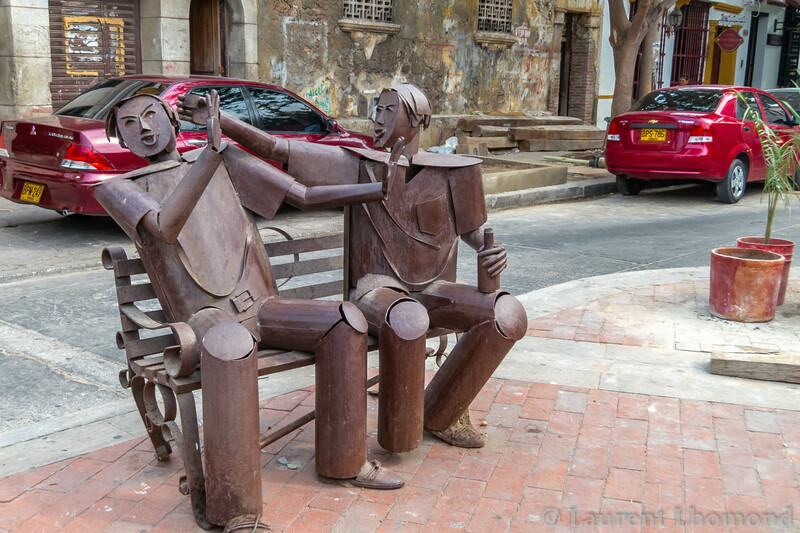 The Plaza de Santisima Trinidad, which is the oldest plaza in the city, used to be one of the most dangerous hangouts in this barrio. 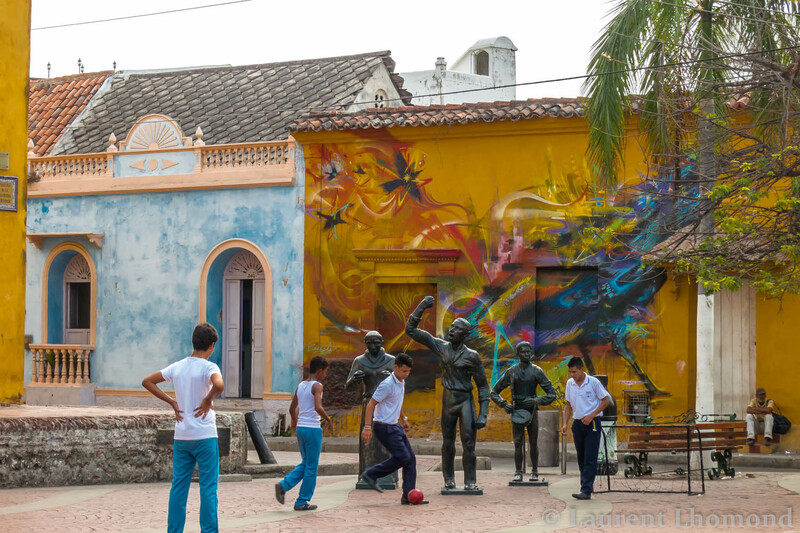 Today, children play soccer there by day and at night families come, eating arepas and and playing music. The transformation here from savage to family friendly is impressive. 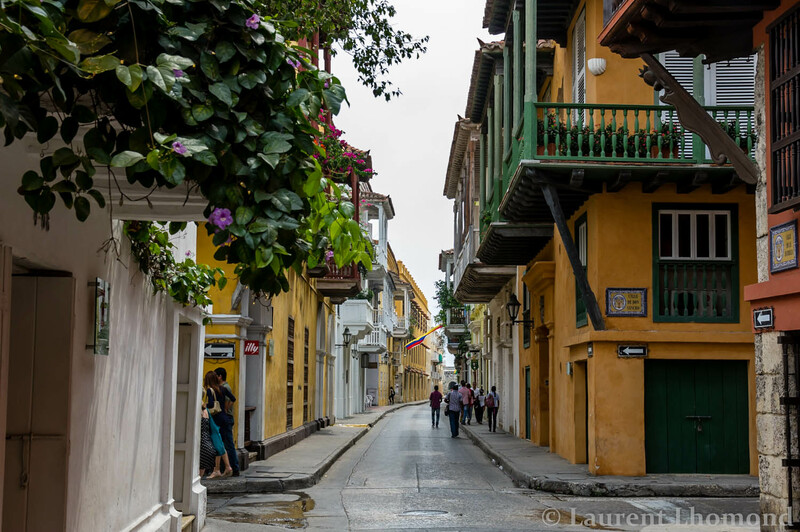 There wasn’t one time where we felt unsafe in Cartagena. Military police patrol the streets daily and nightly. 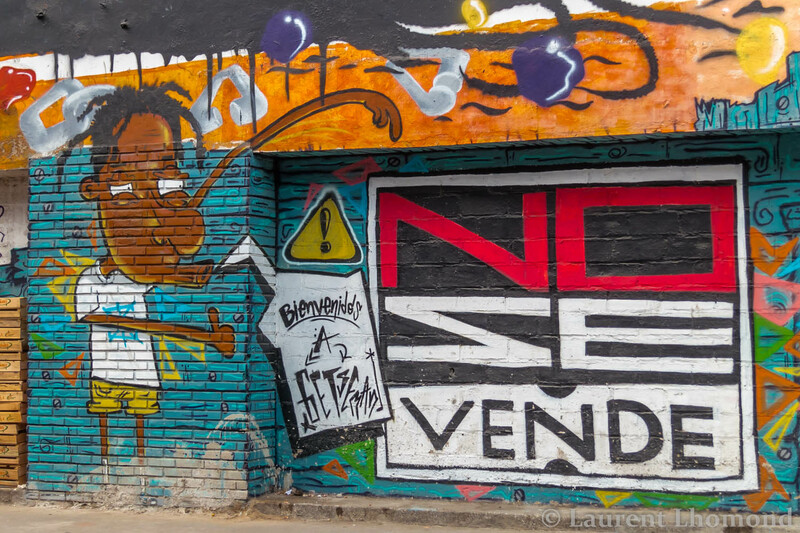 In Getsemani, half the fun is hanging around til nighttime, when the Plaza Trinidad really comes alive. 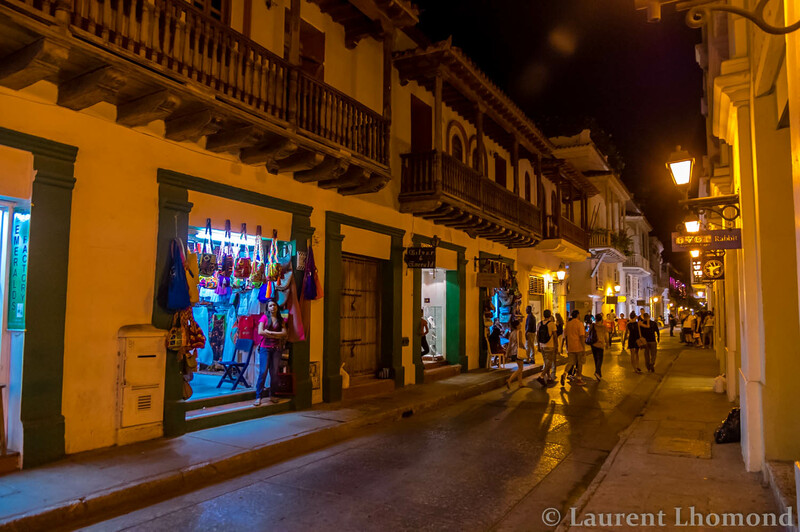 I love Cartagena by night. Not only does the temperature cool down and you are blessed with a breeze but the old lighting fixtures bathe the city in a golden, romantic hue. 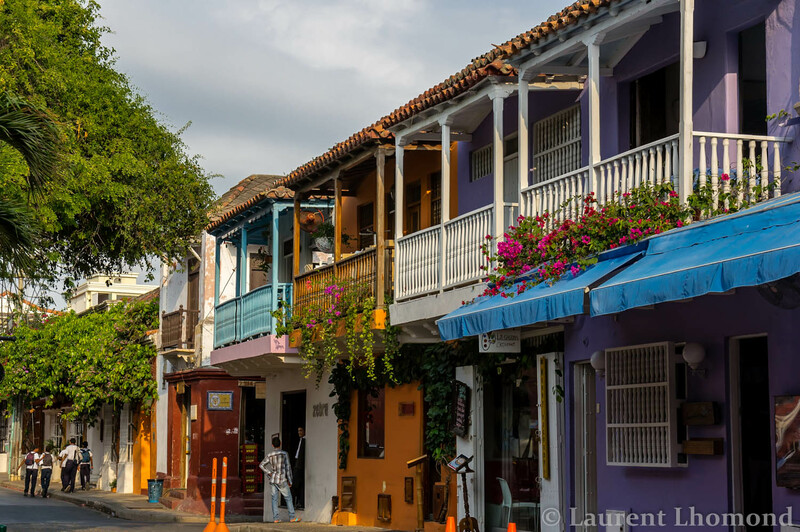 Do not miss this city if you are coming to Colombia! 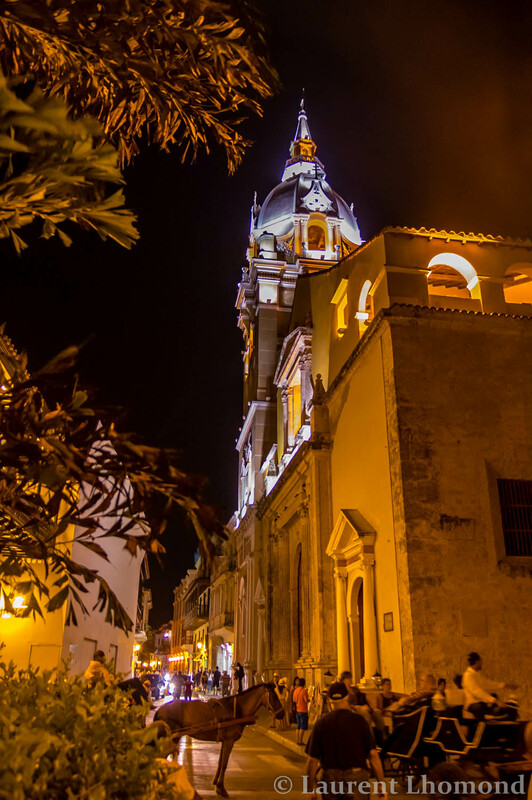 Cartagena looks absolutely amazing. I’m actually planning to travel for a couple months and I’m choosing between Colombia, Panama and Mexico. Colombia is my top choice but I’m concerned about budget…Do you have any advice about a realistic daily budget? Judging from your photos I know I would love it there!! Hey travellush! Colombia is indeed beautiful, from what we’ve seen. Hope you get a chance to experience it! As for daily budget it depends on what kind of traveler you are. We are on a budget but we like our luxuries here and there-we like to enjoy the local foods with a splurge or two on a nice restaurant. Since we are a couple, we prefer double rooms over dorms. And we like to have a beer or two every now and again. We have spent about $35/40 per day each for that. If you are a real shoestring budget person who just stays in dorms, only eats set meals/fruit or skips meals to save money & never drinks alcohol, you could probably do it on $25/30 per day. 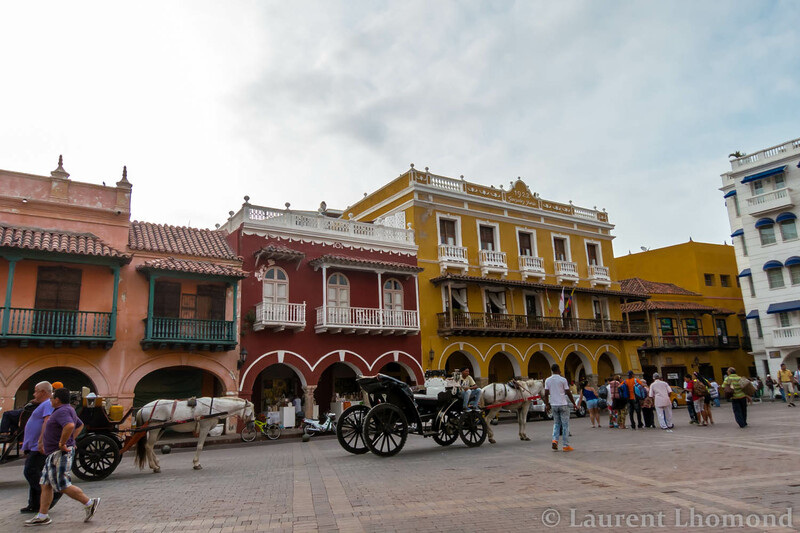 Cartagena has been the most expensive place we visited and we were at about $40/50 per day there. For us so far double rooms have cost about US $25-35 (for the total room); dorm beds about $10-15; bottle of water 1.5 L (you can’t drink the water on Caribbean coast) is about US $1.50, beer about $2-2.50; set lunch is about $5; meal in a nicer restaurant is about $15; groceries are pretty cheap too-depends on what you buy-local produce is very cheap but imported things are very expensive. Also keep in mind, these prices are for the Caribbean coast, where we have been for the past month. I hear it’s cheaper more inland. Hope it helps and if you have any other more specific budget concerns, please let me know and I hope I can help! Oh lovely! If you have time, I highly recommend visiting Tierradentro in the south. It was one of my favourite places, with lots of hiking and friendly local dogs to accompany you on your way. Plus, I had the freshest and tastiest empanadas in Colombia, from the little shop just opposite the school in San Andres village. As usual awesome pics! Nan you’re so talented, amazing writing skills😉 it still sounds too hot for me though 😔, please be careful with that fruit on the street. Thanks for info on Jet Blue, always good to know, miss you and glad ur having a blast!!!! Hey! Lovely blog you are running! I have been following it for a while and I really enjoy it. I’m writing to you because I’m writing a Swedish blog about bars all over the world. 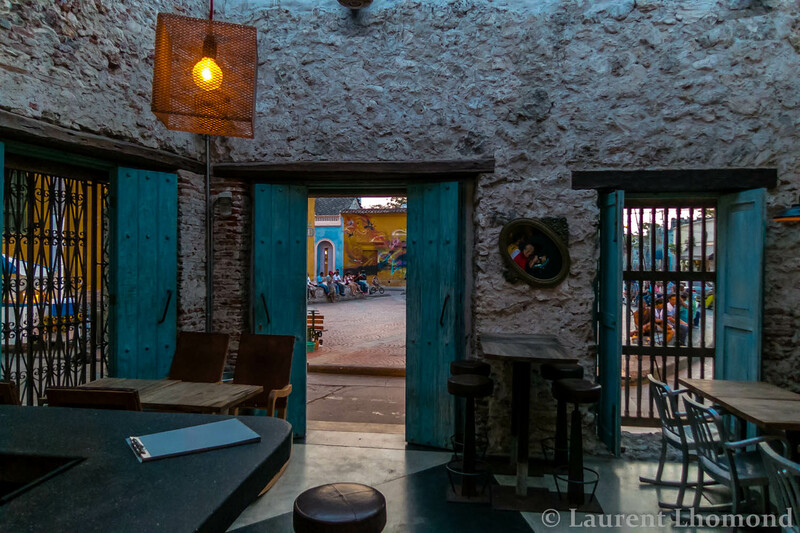 At the moment I’m writing about the lovely Havana Café in Cartagena but I have unfortunately lost my photo material. My question to you is if I can maybe use your photo? They would of course be attributed directly to you! If this would be possible than I would be really grateful, if not then I fully understand! We’d love the link to your blog! Hey! That is so nice of you! Thanks! Hey! That is so nice of you! I really appreciate it! The blog is going to get launched in a couple of weeks and then I will release ten bars directly, Café Havana is one of them! I will make sure to link it to you then!